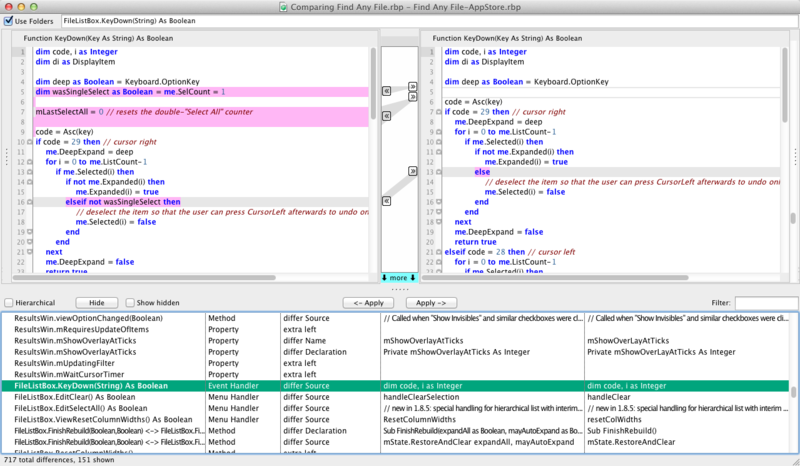 SCM is used to maintain revisions of your source code. Arbed has a few features to help with SCM. If you store your .rbp or .xml projects in a Git, Mercurial or SubVersion repository, the differences can be well shown in the usual SVN and Git frontend (client) tools. However, Arbed can be used as an external tool to show the differences in a better way. Note that Arbed knows the method boundaries and that you can navigate from method to method (or propery, constant, etc) in the lower list. Furthermore, Arbed does not show you insignificant changes to files that the IDE often causes, such as moved items, or added/removed default properties of controls (ever seen the "Tabstop" field appear and disappear in windows, for instance?). Arbed only shows what is relevant to your functional code, and does this in a more structured way than a dumb textual viewer could ever achieve. You get syntax highlighting, and you can even edit the code in place - the editor auto-indents your REALbasic code just like the IDE. 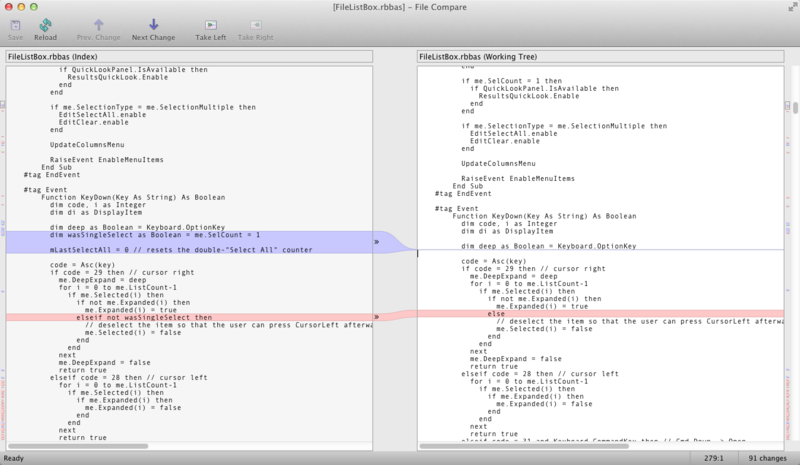 You can use external code items, and Arbed can display their differences just the same as with the main project. A few frontends do support the use of external comparison tools such as Arbed, and I recommend SmartGit/Hg for its x-platform availability and straight-forward approach.